The Training is a newly established component under the framework of the Informal ASEM Seminar on Human Rights series. It was introduced in 2017 to support the series' overall objective of promoting mutual understanding and cooperation on human rights issues in ASEM. The purpose of this training is to improve the capacity of ASEM Partners to promote human rights in their work. The upcoming Training on “Human Rights and Children” as a follow-up of the 17th Informal Asia-Europe Meeting (ASEM) Seminar will take place on 9-13 April 2018 in Leiden, Netherlands. This 4.5-day training mainly targets representatives from ASEM governments, ministries or departments, national and regional human rights institutions working on human rights and the rights of children. Limited places are available for civil society organisations working on the implementation of the UN CRC. The Training shall closely examine contemporary children's rights issues from a legal perspective accompanied by outlooks from other academic disciplines, legal systems, local viewpoints and realities. This training is a follow-up and carries forward the recommendations of the 17th Informal Asia-Europe Meeting (ASEM) Seminar on Human Rights on the theme of Human Rights and Children that took place on 7-8 November 2017 in Sofia, Bulgaria. The Training session will take place at Leiden University. The Informal Asia-Europe Meeting (ASEM) Seminar on Human Rights promotes mutual understanding and co-operation between Europe and Asia in the area of political dialogue, particularly on human rights issues, and encourages an open and non-confrontational debate between representatives of civil society organisations and officials from all ASEM Partners. The Seminar series was initiated by France and Sweden in 1997 on the occasion of the 1st ASEM Foreign Ministers' Meeting. The Informal ASEM Seminar on Human Rights series and the Annual Human Rights Training are co-organised by the ASEF, the Raoul Wallenberg Institute (nominated by the Swedish Ministry of Foreign Affairs), the French Ministry of Foreign Affairs and International Development, the Philippine Department of Foreign Affairs and the Swiss Federal Department of Foreign Affairs. ASEF acts as the Secretariat of the Seminar series. This page will constantly be updated with further information on the Annual Human Rights Training. Do check back again for more details. The Asia-Europe Foundation (ASEF) had the pleasure to organise the training component of the 17th Informal Asia-Europe Meeting (ASEM) Seminar on Human Rights, on the theme of Human Rights and Children, in partnership with Leiden University on 9-12 April 2018, The Netherlands. It was a follow-up to the 17th Informal ASEM Seminar on Human Rights, on the same theme, that took place last year on 7-8 November 2017 in Sofia, Bulgaria. The Main Rapporteur of the 17th Seminar, Prof Ton LIEFAARD from Leiden University, Leiden Law School, led the training and drew on the recommendations presented at the end of the debates and deliberations of the Working Groups at the 17th Seminar in Bulgaria. Ms Amihan ABUEVA, Regional Executive Director of the Child Rights Coalition Asia, The Philippines, and 3rd Working Group Rapporteur, also contributed to the training as a trainer. Ms Ophelia KANEVA, co-host of the 17th Seminar in Sofia, as the Chairperson of the State Agency for Child Protection (Bulgaria), and current Lecturer on the Rights of the Child at the University of Plovdiv "Paisii Hilendarski", Bulgaria; also briefed the participants about the children's participation and outcomes of the first Informal ASEM Human Rights Seminar in the Balkans. Over the course of 3.5 days 18 participants, composed of both ASEM government officials and a few civil society members, explored topical children's rights issues through a multidisciplinary approach encompassing legal, business and NGO perspective. A mix of Asian and European scholars and international child rights' experts conducted the training to give the participants a broad landscape about the problems and possible solutions affecting children rights in Asia & Europe. The participants benefitted from the academic environment and resources of the Leiden University campuses in Leiden & The Hague. They got the opportunity to listen in on live court proceeding at the International Criminal Court (ICC) at The Hague, and were tutored by renowned prosecutor Ms Gloria ATIBA-DAVIES, Head of the Gender and Children Unit in the Office of the Prosecutor, ICC. 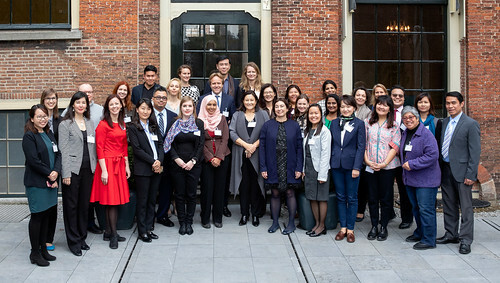 While in the Hague, the participants were also instructed by Mr. Arjen van den BERG, Deputy Head of the Asia and Oceania Division, Ministry of Foreign Affairs, on the challenges and best practices of the Netherlands and outreach efforts of his Ministry in relations to Children's Rights in Asia & Europe. Besides sharing the Key Messages of the 17th Seminar, the training attempted to enhance participants' knowledge on Human Rights and Children in the context of Asia and Europe, and build their ability to promote and protect the rights of children in their daily work. Should you wish to learn more about the Informal ASEM Human Rights Series, click here.